Recently, Kindergarten students have been working on the “Communication Through Art” unit. As part of the unit, they visited the Van Gogh Museum to get inspiration. 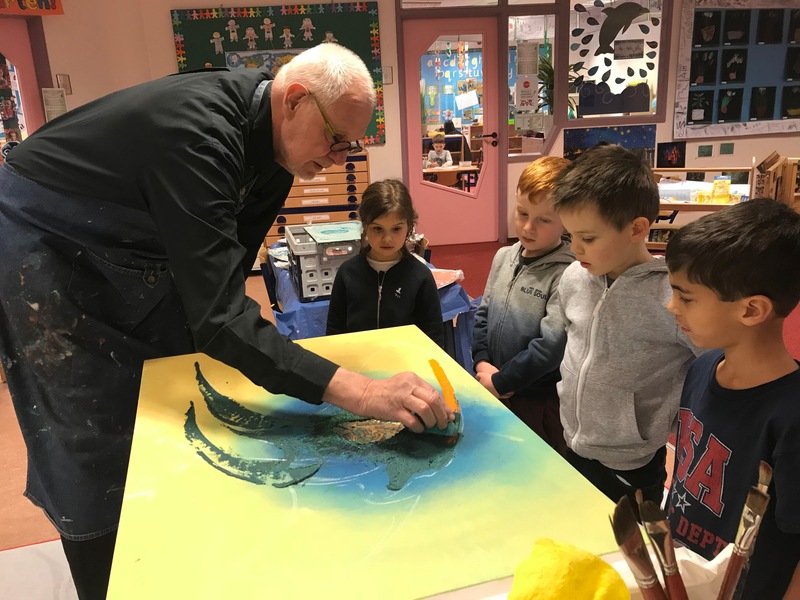 On Wednesday, 7 February, local Amstelveen artist Anne Leegstra visited the Lower School to give the students a taste of a real artist’s work. Anne set up a canvas in the centre of the classrooms, which the students gathered around to watch and ask questions as Anne breathed life into his artwork. Using sponges and a pallet knife, Anne created a painting using bold colours. The students have also been using these same tools and materials to create their own artwork. Seeing them used in action by a real artist was a wonderful experience for them. For teacher Cathie Ellis, it was valuable for the students to meet a real, living artist, to add to the students view of art and the artist’s work as a process which compliments wonderfully the artwork they saw hanging in the Van Gogh museum. Cathie believed that the students gained a deeper understanding of the process of creating a piece of art, by seeing the artwork not as instantaneous but as something that is added to over time. As a culmination of the unit, Kindergarten students will hold a week-long Art Gallery exhibiting their work in the ISA foyer, starting on 12 December. 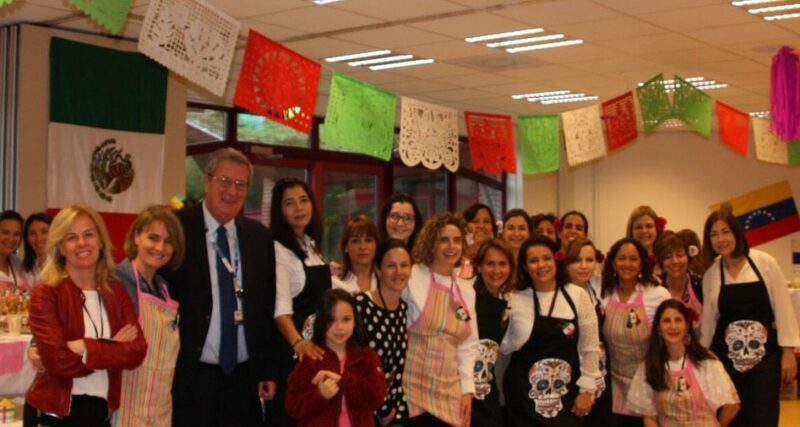 Connecting with people from different generations is important for developing compassion, respect and empathy in a child, all of which are key beliefs of the International School of Amsterdam. Exploring and developing these intergenerational relationships is vital to the growth of children as it provides opportunities for empathy and guidance, while fostering respect between people of different ages, backgrounds and cultures. In developing the leaders of tomorrow, the real wisdoms and life experiences of older people is an invaluable tool for teaching students values such as integrity, compassion and reflection. At ISA students are provided with many opportunities to engage with elderly community members in the Amsterdam region, ultimately resulting in a mutually beneficial relationship of understanding, friendship and admiration. These intergenerational connections were on show recently when residents from local care homes, De Luwte and Middenhoven, visited the school to watch, and take part in, the bi-annual ISA music concert, organised by Middle School Music teacher, Judy O’Callaghan. The presentation featured solo performances from students on the piano, violin and guitar as well as a group ‘tin-whistle’ performance from the Grade 6 music class. The songs ranged from traditional Irish compositions to newer popular songs including When We Were Young by Adele, performed by student Cezere on the piano. “Through the preparation and then the performance the students are learning really important skills about collaboration, being respectful and working together. Skills such as thinking, social, communication, self-management and research are encouraged and developed through the music programme,” O’Callaghan commented. The audience was also treated to a special performance from the popular Dutch accordion group TAVENU who performed a range of traditional Dutch songs. O’Callaghan herself was a former member of group, having participated and performed with them at a number of events. These relationships are mutually beneficial too – the developing minds of children are open and willing to learn, and their optimism was reflected in the smiles of the senior community during the performance. 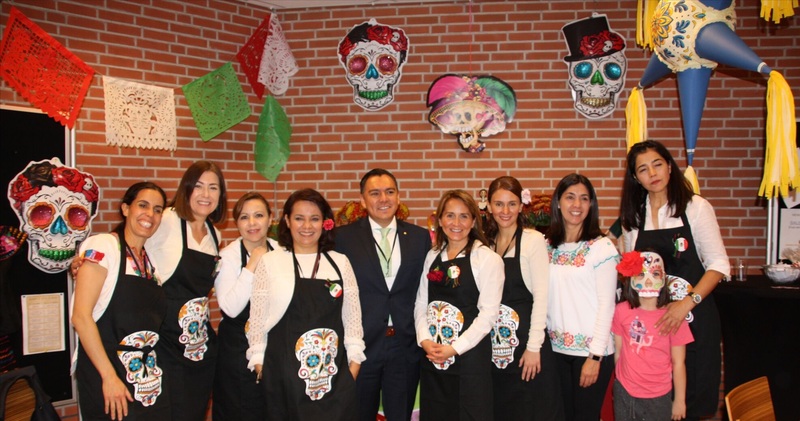 ISA students have also previously connected with local senior community groups through the Creativity, Activity, Service (CAS) part of the International Baccalaureate Curriculum. Recently, students participated in the Global Issues Network conference in March this year to present projects that connected them to the local community and overcome linguistic barriers. One of the projects included a visit to the local elderly centre, Klaasje Zevenster, where students used art as a tool to connect and integrate with the local Dutch-speaking community. Another CAS project, ‘The Buddy Project’ will also be hosting a community event at the end of the school year, inviting refugees and the elderly community for a day of fun and activities in Amsterdam Bos. CAS Coordinator Vlad Gogelescu remarked on the positive experiences gained through students interacting with the elderly community. The Netherlands is considered a leader in developing innovative ways to connect younger and older generations which includes local initiatives such as the providing accommodation for university students in elderly living facilities to develop lasting relationships between young and older people. The project, which is currently being undertaken in Deventer, has received worldwide attention for its innovative solutions to the challenges of housing, social isolation and intergenerational connections. Currently, there are six students in accommodation at the facility who are required to offer 30 hours of time to being ‘a good neighbour’ and connecting with the elderly community, in exchange for no cost accommodation. Research has shown that reducing loneliness and social isolation amongst older populations improves wellbeing, which this initiative aims to address. The initiative also gives young people a greater sense of compassion and connection with older people and build valuable volunteering skills that are continued well after their studies. Providing similar opportunities for volunteering and connection with local elderly care centres in Amstelveen and Amsterdam is key to ensuring that students at ISA develop important life skills including compassion and empathy as well as valuable volunteering experiences that will help them in their careers after school. Grade 3 students and Upper School French-language students were given an insight into the first-hand experiences of an asylum seeker when Justin, a Congolese refugee, visited ISAthe school to share his story. Brett Preiss, ISA Lower School English as an Additional Language teacher, invited Justin to come and speak with his grade 3 students as part of their recent unit of inquiry, Believe it or Not. The unit explores students’ understanding of beliefs and belief systems and challenges them to see how this affects their own lives and the broader world in which they live. “We wanted to invite Justin to share his experiences and how his similar or different his beliefs and values are to those of the children.” noted Preiss. Justin left the Republic of the Congo five years ago, and arrived in the Netherlands without a home, his family, or any local knowledge of the Dutch culture or language. In the years that followed, he was able to teach himself English and Dutch, and took advantage of social opportunities opportunities to integrate himself in the community, including joining acting classes where he met that are also attended by Preiss. The PYP curriculum has a strong focus on the 10 IB Learner Profile Attributes—inquirers, knowledgeable, thinkers, communicators, principled, open-minded, caring, risk-takers, balanced and reflective. Preiss chose to use these attributes as a tool for guiding the discussion with his young students. “We focused on the IB Learner Profile attributes and asked Justin to share how he has been a risk-taker by leaving his family and country, and moving to a totally new land.” explained Preiss. Being an international school, this concept of relocation was familiar to the students. However, the circumstances in which Justin had to move gave them new insight into how his journey to Holland differed from theirs and allowed them to reflect on the plight of refugees and the sacrifices they must make to start life over again in a new home. To that end, the school also connected Justin with the ISA IT team, after learning of his interest in video editing and development. He was shown some of the latest editing tools and software used in an ISA student’s daily life to guide him on the technologies that are shaping the future. Preiss hopes that Justin’s connection with both his students and the Upper School French classes made a lasting impression and that both he and ISA can continue to help Justin and other refugees to get their stories out there to discover new connections in the Netherlands as they build their lives. Justin also showed a keen interest in video editing and development, so during his visit to ISA, he was able to connect with one of the IT Station staff who showed him some of the editing tools and software used at the school. Mr Preiss said that he invited Justin to present to students in Grade 3 who have been learning about different beliefs through a unit of inquiry called, ‘Believe It or Not’. Students and staff all relished the opportunity to listen to and learn something new from Justin, and while his story was at times challenging and confronting, there was opportunity to be inspired by his incredible story of perseverance through adversity. “For Justin, this visit was a really memorable and rewarding experience, because he truly believes his story should be shared and that by doing so he is able to help our students and others appreciate what they have” noted Preiss. Art serves as a bridge across cultures—communicating the emotions, experiences and perspectives of the artists to the world around them. At ISA, the arts play an integral part in the Primary Years, Middle Years and Diploma programmes, allowing students of all ages to creatively share their own views through various media. Each year ISA’s Kindergarten students, under the guidance of Lower School Visual Arts teacher Frankie Rees, explore how art can be used to as a form of communication through the study of Dutch artist, Vincent Van Gogh. Working with their homeroom teachers and in their dedicated art classes, the students create individual art pieces, inspired by Van Gogh, that reflect the learnings in the unit of inquiry (Find out from Frankie what this was). Gaining inspiration from class discussions and a field trip to the world-renowned Van Gogh Museum, the student extended (name of Unit) to artworks which they displayed for the entire ISA community in a full-scale art gallery set up in the school’s main foyer in March. Parents, staff and students who attended the gallery throughout the week were all extremely impressed by the range of artworks. “It was really wonderful to see how the kindergarteners have taken such pride in their work and exhibiting each students work showcases how each of them have grown throughout the process.” noted Rika Maja Duevel, ISA Upper School Visual Arts teacher. The ISA Green Team organised a beach clean-up for the first time on Saturday. A group of students, parents and staff participated, bringing together people from across our school. We’d been warned to dress up warm after a windy week and were fully prepared to brace ourselves against the cold. But we were pleasantly surprised by the gorgeous weather that awaited us on the beach at Zandvoort. We found a wide variety of objects including a diaper, bottle tops, cans, cartons, plastic bags, straws, socks, string, styrofoam, pieces of glass, buckets, string, an old body-board, a tyre and even a curtain! We also visited the Jutters Museum further along the beach which houses a fascinating collection of an even wider range of objects than we’d collected such as pacifiers, slippers, buoys and boat signs. The museum also houses displays of local natural history and creatures from the sea. A Spring event will be organised as well. Keep an eye out for more information after the Crocus break. 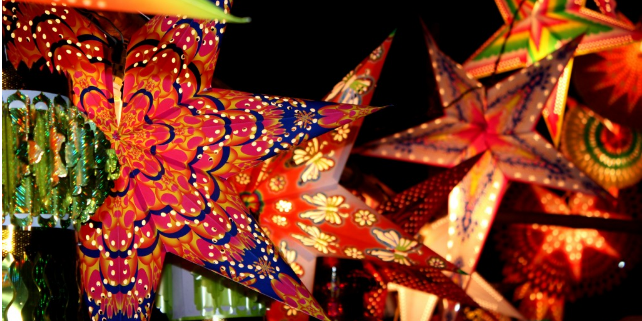 In the lead up to the darkest time of the year, the annual PTA Festivals of Light event took place on 17 November, with parents from our Israeli, Indian, Dutch, Spanish and Italian communities presenting information about their cultural events which celebrate light. An annual favourite, this event was open to the ISA community as a whole and a number of Lower School classes had scheduled visits to learn more about the different celebrations, which will be especially meaningful for those grades who were studying ‘Celebrations’ and ‘World Religions’. As an international community of learners, understanding the meaning behind the celebrations of our friends and families allows us to remain true to our mission to educate for international education.